Flutter is an open-source framework that lets developers create apps for both iOS and Android. 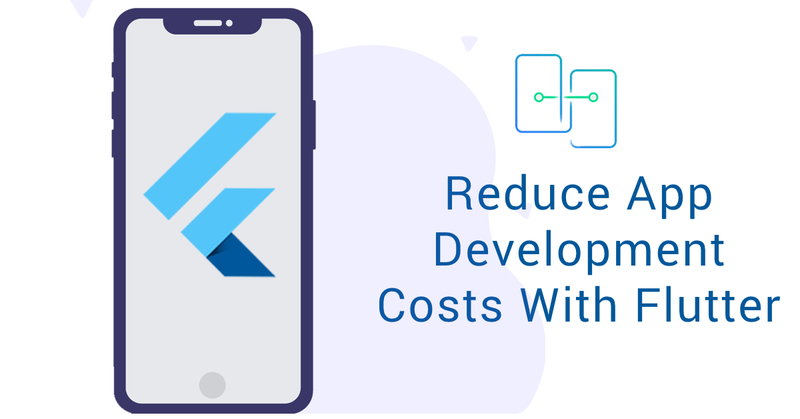 With app development becoming more complex and costly, Flutter offers an excellent opportunity for developers to cut the cost in many ways. We recently covered why flutter is the future of cross-platform app development. In this article, we will be exploring the reasons why Flutter makes app development less costly than native Android and iOS apps. The first thing that we are going to talk about is the cross-platform app development. It provides a unified app development environment which means that the developer only has to write code once and it will work on the various platform. Cross-platform app development is not new and is already being used by developers and supported by organizations. For example, React Native and Ionic already support cross-platform app development. However, Flutter makes it super easy to develop an app that runs on both platforms. It also lets developers take advantage of the native features that are offered by each platform, i.e., iOS and Android. Hot-Reload is a fantastic feature that enables the developer to see changes in real time. This allows teams to add new features, experiment and fix bugs in their build. In return, the overall time to release is quickly reduced which brings down the time that is required to build and release the app. However, it is not the ultimate solution and does come with some limitations. Overall, it overcomes the barriers of native app development which can take up to 2-3 minutes to see the changes that are made to the code. With so many startups on the market, you’d definitely need a Minimum valuable product (MVP) to convince your investors. And for that, you need to create an MVP that works on different platforms so that you can show its applicability across them. Flutter can help do just that. By making your MVP in Flutter, you can save both time and cost. Not only that, you can use the MVP to build your product since the code written in Flutter is of great quality. Flutter is an open-source framework. This means that while you don’t have to pay to use it, you can rely on the vibrant and active community to bring in the latest innovations to the framework. The only investment that a company or startup needs to make is to find good developers that can work using Flutter. Flutter is easy to learn which means that the developers can ramp-up and build apps very quickly. Once again, hot-reloading works in favour of new learners too. The total number of line of code written is almost connected with the cost of the project. In a post by Tomislav Car you can learn how Android development is costlier than iOS. In his findings, he further points how lines of code impact the overall development cost of an app. All of this means that you need to write less code to achieve the same level of performance. Other key features that help write good performance apps using Flutter include AOT, JIT compilation, Hot-Reload, etc. Flutter’s impact on the project cost is undeniable, and the major reason behind is its cross-platform support, less code, less time to MVP or market release, and Hot-Reload. Although it has tough competition from React Native, but due to performance gains, Flutter is going to be the winner in longer run. We’ve been developing using Flutter for quite some time now and we firmly believe that it is the future of cross-platform app development. And not just that, Google is pushing Flutter to be used on their new Fuschia OS and other operating systems. Looking to get something done in Flutter? Get in touch. Previous Previous post: Why flutter is the future of App development?